On the ninth of September 2009, the bells of St Lawrence were returned to their tower for the first time in a quarter of a century. The bells rang out over the rooftops of Ipswich, and there were emotional scenes, because these five bells, all cast in the 1440s, are the oldest circle of five bells in the whole world. Anyone visiting St Lawrence church today, particularly if they are a visitor to Ipswich, may not realise quite what an extraordinary journey this church has been on over the last 130 years, and particularly in the last couple of decades. 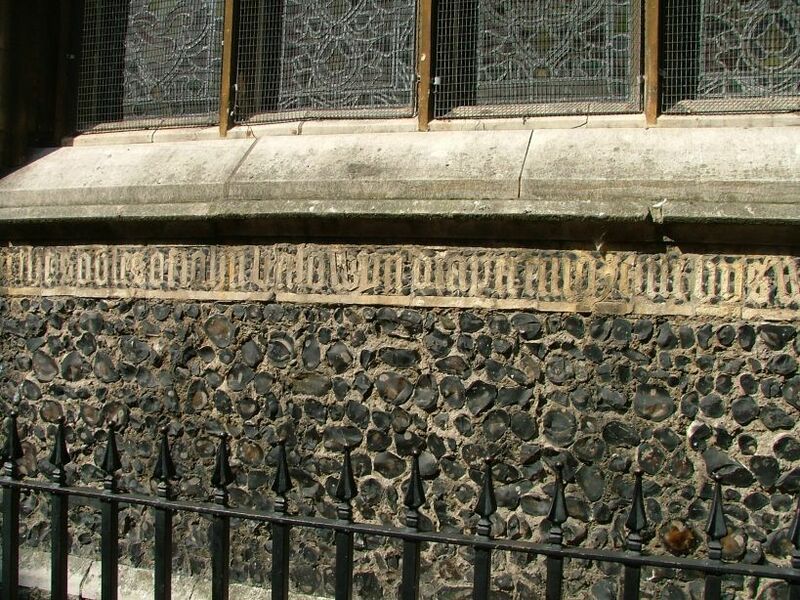 For this, above all others, is the Ipswich church which was nearly lost to us, but which has come back from the dead. In 1846, Thomas Dugdale's County Views series showed Dial Lane in Ipswich (above) lined with old shops, some of which survive today. Above them towers a fine 15th century tower, its windows outlined in brick, curious little 18th century urns topping the corners of what is otherwise a typical Suffolk church tower. In 1882, the London firm of Barnes and Gaye were commisioned to rebuild the upper part of the tower of St Lawrence's church. 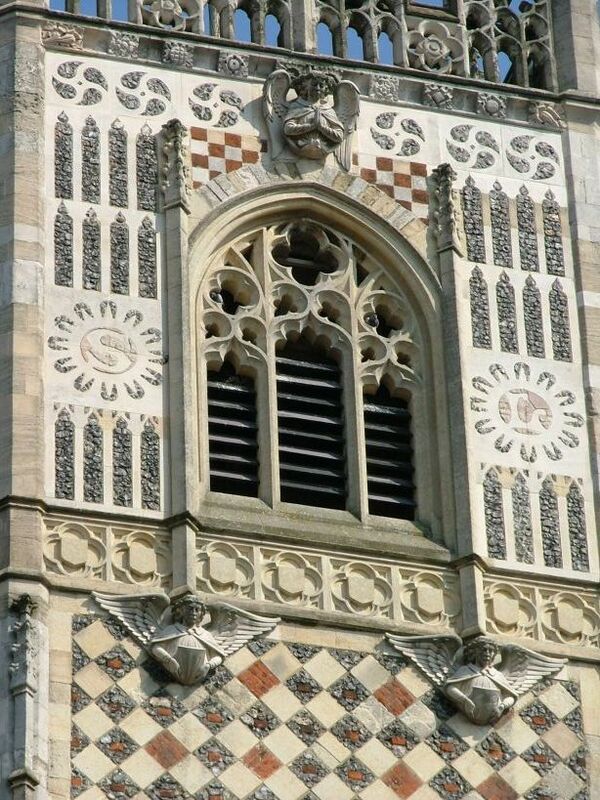 They produced one of the most extraordinary confections to grace any Suffolk church, more noticeably so because of the rarity of Victorian towers in Ipswich in particular and Suffolk in general. 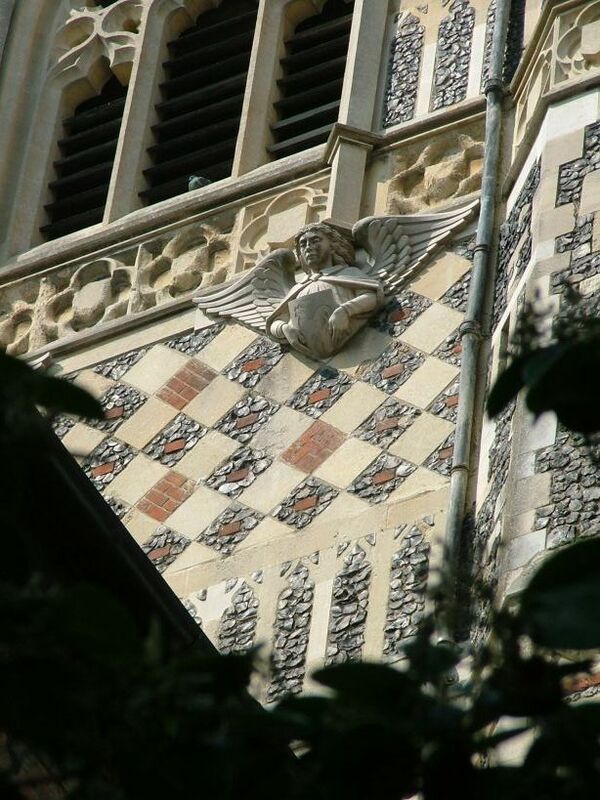 Angels, flowers and mystical symbols interleave amongst geometric flintwork designs. Since the tower was cleaned in 1996, the variety of materials used has become apparent, from brilliant whites and soft pinks to the yellow of the stonework and iron grey of the flint. St Lawrence has a more enclosed site than any other Ipswich church, perhaps more so than any other church in Suffolk, and, as a consequence, this wonderful tower constantly disappears and reappears from behind buildings as you walk around Ipswich town centre. Each side of the tower is different; each view and each perspective have something new to offer. 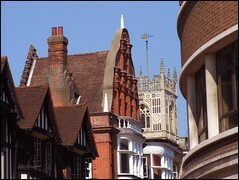 This is not just an important part of the townscape, but has become a symbol of Ipswich itself. 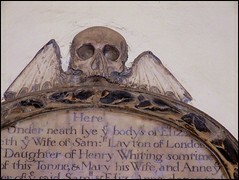 At the base of the tower, the west door opens into Dial Lane, an intimate access familiar from City of London churches. 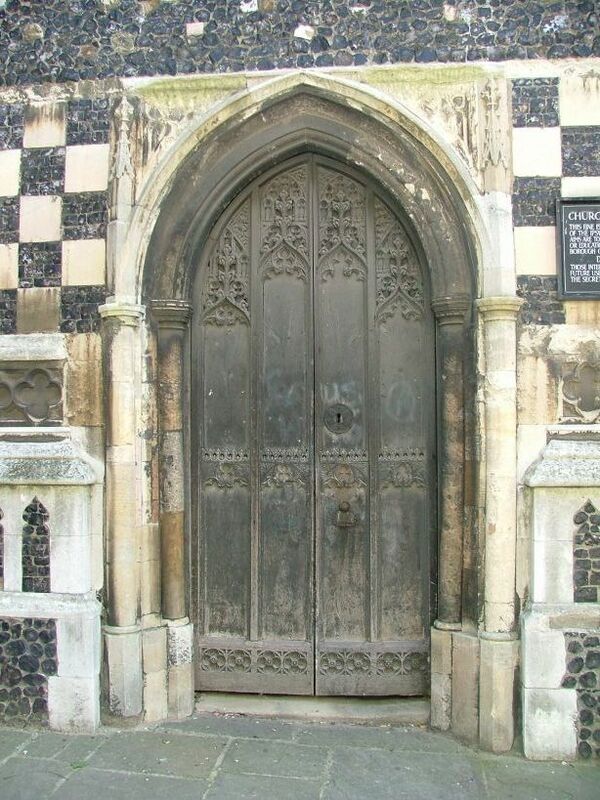 The base of the tower also contains north and south doorways, a processional archway beneath the tower exactly like that at the town church of Diss St Mary in Norfolk. Through these arches the blessed sacrament would have been carried in state on its journey through the medieval town; you can see something similar in Suffolk at Combs and Stanton St John. To stand outside the west door of St Lawrence is to get the beginning of a sense of the meaning and role of churches such as this in times past. 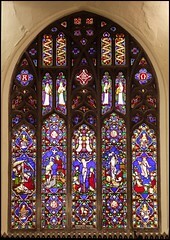 Uniquely, the Victorian restorers left the church with no central aisle, in an attempt to defeat the introduction of High Church practices. However, beautiful towers and aisleless naves are not enough to attract parishioners. 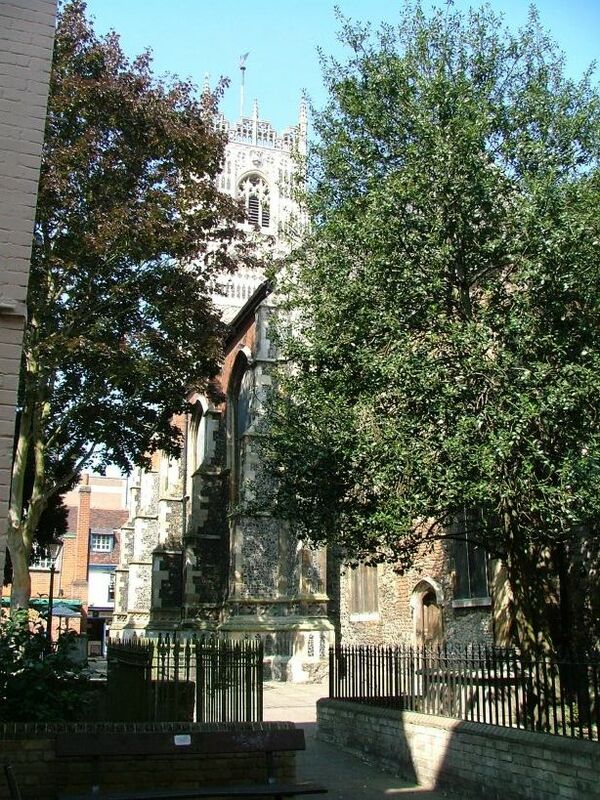 By the early 1970s, there was no one left living in the parish, which was a severely small one, sandwiched between St Stephen and St Mary le Tower, and no more than 20m across in places. 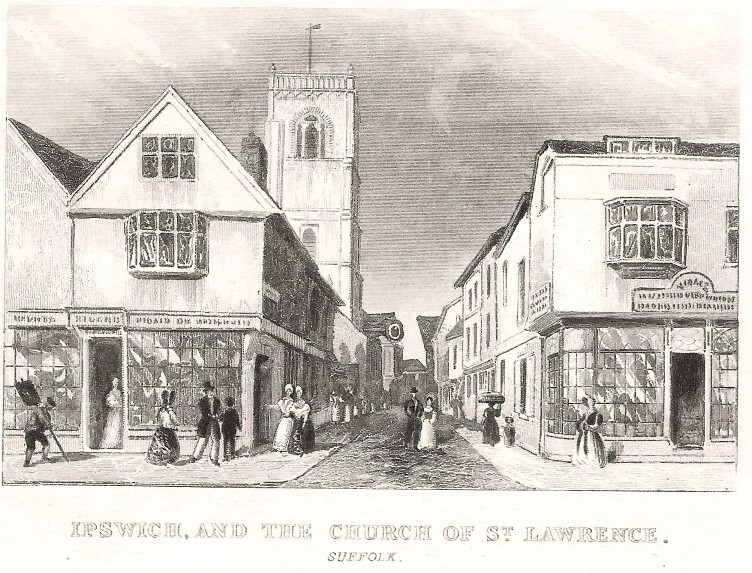 St Lawrence was closed, declared redundant, and, once the Diocese had washed their hands of it, entrusted by Ipswich Borough Council to the care of the Ipswich Historic Churches Trust, with no doubts that a new use could easily be found for such a central, beautiful and useful landmark building. But his did not happen, and St Lawrence was soon in big trouble. By 1995, the floor had become so unsafe that it was not possible to walk across it. By the time I visited it in 1998, the side floors had been removed, and the inside (apart from the sanctuary) was now little more than a shell. 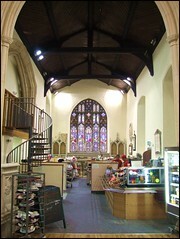 On a visit in 1999, the church floor was littered with rubble, and was being used to store furniture and garden ornaments. Parts of the bell frame and bell wheels, which had once supported a completely pre-Reformation ring of five bells, were stacked against the college-style pews along the walls. 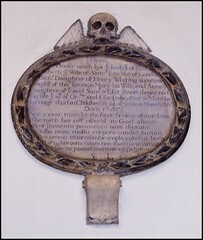 Above, the Victorian stencilling was still readable: Blessed are they that mourn, for they shall be comforted... You can see the photographs I took on that occasion. Thereafter, it became much too dangerous for public access, and the building was closed permanently. Many plans were put forward for the use of this building. But it had no electricity, no running water, and the costs involved for any non-commercial organisation would be prohibitive. IHCT hoped that a use could be found which would preserve the integrity of the building, as has happened at St Stephen 80m away. But by the time St Lawrence had been shut up for more than a quarter of a century, the effects of neglect and decay were overwhelming. In the Spring of 2000, planning permission was obtained to convert this building into a pub and restaurant. This was about the time I first wrote an account of the church, and I observed then that, despite the long years of neglect, the liturgical integrity of this building would not be saved. 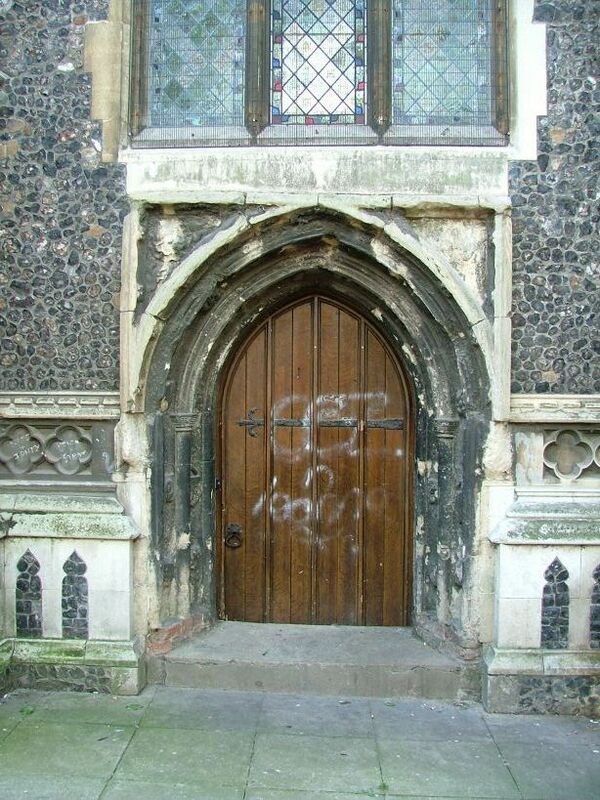 I noted that it was not hard to judge that the Churches Conservation Trust might have been a better custodian. 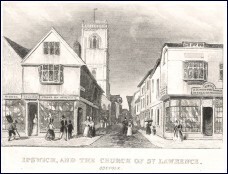 St Lawrence could have been kept permanently open, a place for private prayer and a refuge from the busy shopping streets. And at least it would still have a floor. 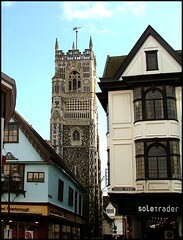 Shortly after this, in December 2001, I received a letter from John Blatchly, of the Ipswich Historic Churches Trust. He wrote that The developer interested in St Lawrence has withdrawn his original planning application prior to submitting another. We have agreed to extend the period during which we give him priority over other interested parties. The mural memorial there to James Thorndike, several times bailiff of the town in the early nineteenth century, fell from the wall and smashed into many fragments when its fixings perished. Its repair will be expensive, drawing our attention to the need to check the secure mounting of all the monuments in our churches. It will shortly be back in position, and I have found Thorndike's portrait which I shall offer with a press release.This is the real problem church. Town centre, but difficult to service and no parking very close at hand. If this developer, who would be prepared to spend a great deal on the fabric, does clinch a deal, the building will be infinitely improved in condition and given a useful future. The use must be carefully chosen, but it will have to be fully commercial. I wondered at the time how turning a church into a pub/restaurant constituted a change of use which was carefully chosen. And, as you may imagine, nothing eventually came of the application and the developer, the JD Wetherspoon chain, withdrew completely, not least because of the seven figure sum which would have been necessary to restore the interior to use. The other interested parties that John Blatchly mentioned also seemed to vanish into thin air, and the church continued to decay in the years after. Without wishing to appear smug, and realising that hindsight has powerful eyes, I must recall that at the time of the 2004 entry for this church on the Suffolk Churches website, I mused that there was no reason why the use had to be fully commercial. 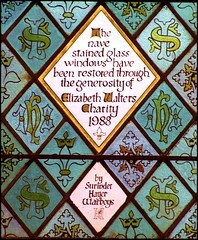 Britain is a rich country, I wrote, much richer than it had been in the 1970s when St Lawrence was declared redundant. And Ipswich was a thriving town. 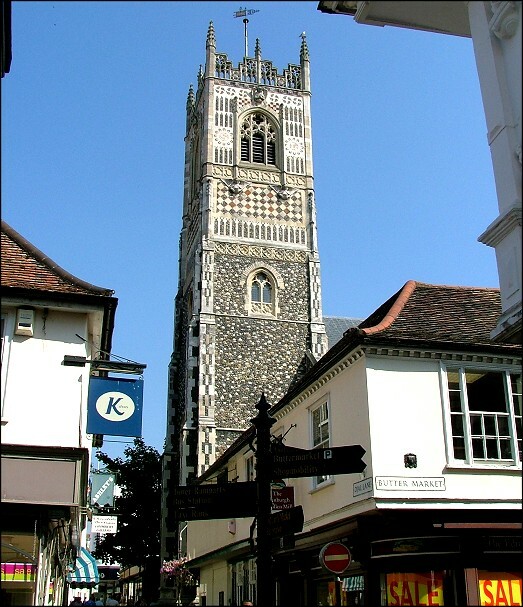 This church's tower is a landmark, and it was hardly to the credit of the Borough of Ipswich, who took possession when the Diocese declared it redundant, to have a derelict landmark at its heart. Light-heartedly, I suggested that perhaps they should take it back from the Historic Churches Trust, bang a few pennies on the council tax, and do something useful with it. Rather extraordinarily, this is exactly what has happened. In 2006, it was announced that the Borough Council and Suffolk County Council were to help develop St Lawrence as a community resource - not a fully commercial use after all. Involved parties included Age Concern, who had previously had a café in the Town Hall, and the project was co-ordinated by Whitehouse Enterprises, an Ipswich-based 'progressive social enterprise' which enables adults with disabilities to find work. 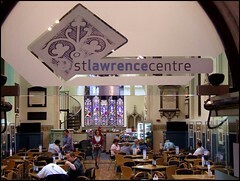 Their two main activities are catering and furniture production, both of which have contributed to the reinvention of this church as the St Lawrence Centre, effectively a community restaurant and gallery. It was opened to the public in July 2008. The fabulous cost of 1.2 million pounds for the restoration came entirely from the public purse. £400,000 was provided by the council tax payers of Ipswich, the rest coming from central government. In the end, it would not have been possible for a commercial organisation to justify these costs, and so it was that the Borough did do something useful on it, although the cost to council tax payers was more like £10 per household rather than the 'few pennies' I had suggested. Whatever you think about that, there is no question that this is a very happy outcome for the building itself. 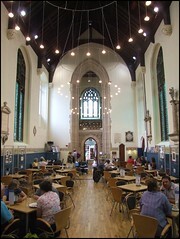 Since there are no internal partitions, the liturgical integrity has been broadly retained, with kitchens and serving area in the chancel and the nave full of tables and chairs. 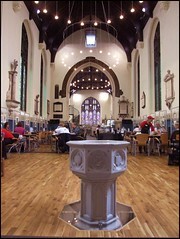 All the memorials, glass and stencilling have been restored and are still in situ. As at St Stephen a few yards away, you still walk in through the west door past the font. The lights in great circles above and the light wooden floor below create the feel of a space that is at once modern, and yet mindful of its past.The overall effect is splendid. 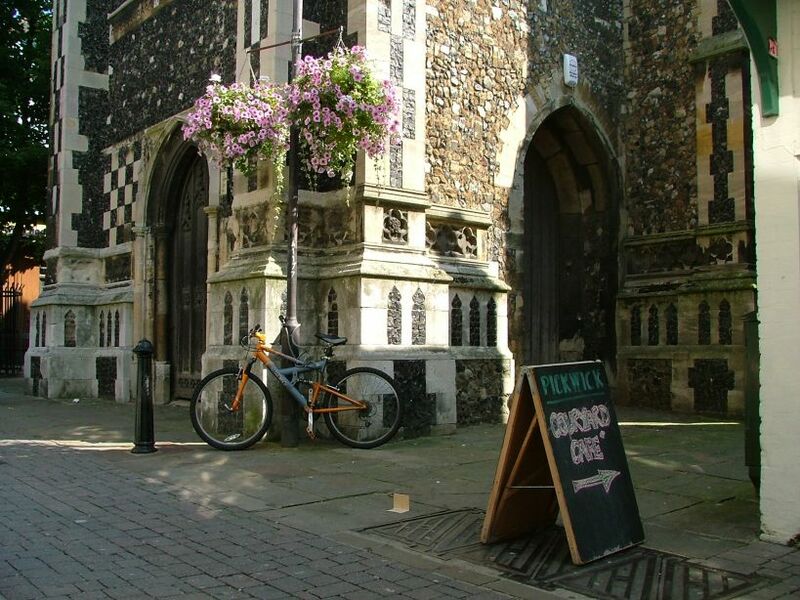 This means that, for the first time in the quarter of a century since most of them were declared redundant, all of Ipswich's six town centre churches are now being used again - although, of course, none of them is in any sense commercial. And what does that matter, as you stand and listen to those wonderful bells?